Mangaluru, Apr 18, 2017: The severe heat along with summer holiday rush have caused Karnataka State Road Transport Corporation (KSRTC), Mangaluru division, to increase the fleet number of air-conditioned (AC) buses. The maximum temperature in Mangaluru on April 17, Monday was recorded at 33 degrees Celsius (at 2 pm) with humidity in the range of 58 and 60 percent. People out doors felt the heat as harsh which was not so bad indoors. 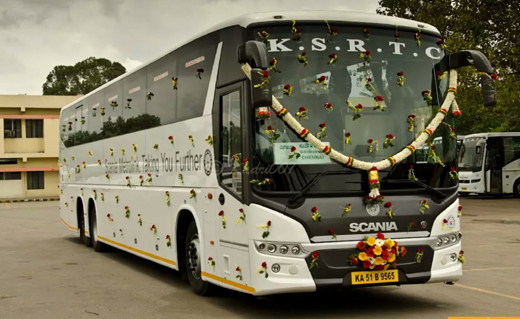 While the number of buses is more on weekends and connecting holidays, four more new Scania buses have been recently added to the existing fleet under Mangaluru division, taking the total number of Scania buses to 14 in the coast alone. Good response : Divisional traffic officer of Mangaluru division said, "Four additional Scania buses are being operated from April 13 and the response is very good. The inaugural run started from Bengaluru towards Mangaluru with full 46 passengers." The buses operated under the name ’Diamond Airavata Class’ is most popular on Mysuru and Bengaluru routes. Most of the techies travelling towards the cities are opting for this service. First lot : The first batch of 10 Scania buses was inducted into Mangaluru depot in January, Volvo and Carona apart, Scania offers many unique built-in features, like 360 degree IP camera, air-condition and better room both for passengers and luggages to name a few. During the night hours, the camera is operated on infra-red mode, with black and white footage guaranteed. Laptop thefts : Apart from meeting the growing demand for AC during summer, it has also helped in checking the complaints of laptop thefts, mostly recorded in such high-end buses with techies topping the number of passengers. Earlier, when the buses were stopping for breaks at times, laptop thefts had become common, with some of the cases even going unreported by the victims. In all, the division has 108 AC buses with majority operated on Mysuru and Bengaluru routes, followed by Udupi, Davangere, Hubballi, Ballari, Kasargod (in Kerala) to name a few irrespective of day and night hours. The division has 513 schedules per day ( both AC and non-AC and regular services), divisional controller of Mangaluru division said. On April 16 alone, 17 more buses were operated on Bengaluru and Mysuru routes including six AC, three non-AC, two Raja Hamsa and remaining regular buses. Owing to connecting holidays from April 14 (Good Friday), more buses were operated, it was told. In the period of three months from April to June, a peak season mostly due to holiday passengers, July to September is considered low due to rains. Dasara vacation is considered as another peak season in the year starting from October. Introduction of Scania buses will add to the comfort of those traveling.